In this episode I focus on social video in a mobile first world. Snapchat’s growth is stalling, according to figures released in its quarter two earnings report. Their user growth rate slowed from 5% last quarter to 4.2% this time around. They have added 7 million users this quarter to their daily active user (DAU) bottom line, bringing them to 173 million. But if you compare this to their biggest rivals you see that Facebook added 41 million DAUs in the same period, while Instagram Stories added 100 million daily users since January. But Snapchat execs are focusing on engagement levels, trying to differentiate themselves from other social networks, reminding us that users are spending 30 minutes per day in the app. Facebook TV is here! This week they started to roll out their new ‘Watch’ tab which will show original shows. The content is produced exclusively by its partners who will earn 55 percent of ad break revenue, while Facebook keeps the remainder. A small number of U.S. users have Watch available to them on mobile, desktop and Facebook’s TV apps. 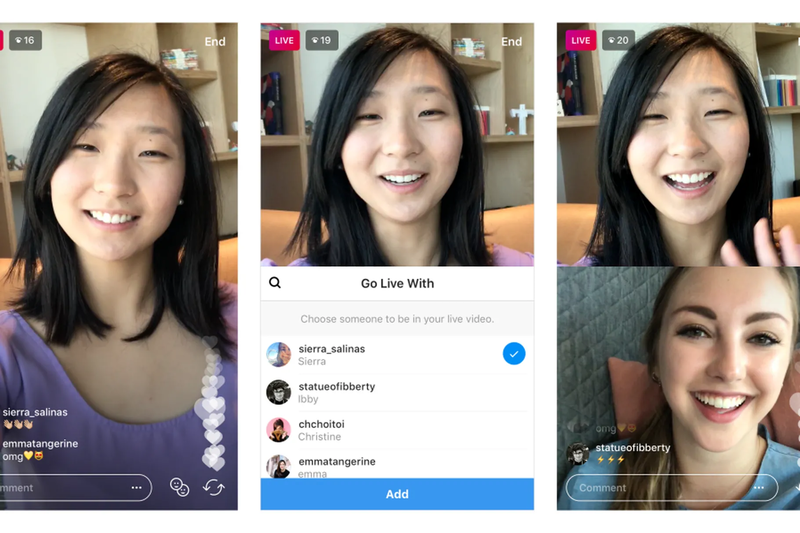 Instagram is adding to its live video capabilities with the introduction of their new ‘Go live with a friend’ feature. Another day, another live video feature! In this week’s show I’m delighted to be joined by Amanda Webb, founder of Spiderworking.com. Amanda is a small business blogger, digital marketing trainer, speaker, podcaster and vlogger. She formed Spiderworking.com to help SME’s, local and small businesses develop social media strategies. She hosts a weekly Facebook Live Show called Digital Coffee on her Page which is awesome! Below is my favourite quote from our interview. Be sure to check out Amanda’s Friday Digital Coffee Facebook Live where she shares social media news of the week. Tune in to the podcast to hear my answer to Andrew’s question. In this week’s show I’m sharing three social video trends that you cannot ignore and need to factor into your social marketing strategies. We live in a mobile-first world. This is the start, the middle and the end when we are considering social video. More and more video is and will be consumed on mobile. Search on mobile has overtaken desktop and mobile aces for social networking. By 2019, video content will be the driving factor behind 85% of search traffic in the US. Whether it’s Snapchat, Instagram, or Facebook, video content on social media is what marketers need to focus on. Consumers want more video and advertisers are investing in both the production of video and advertising campaigns to promote that video content. In episode 59 of JSB Talks Digital I reported how 87% of Facebook’s ad revenue now comes from mobile advertising. Do you want to battle the algorithms? Most of the social networks are now giving priority to video content as well as constantly adding new video capabilities. This trend will continue and as marketers we need to understand how social video is improving engagement and what impact its having on conversions. What’s your social video strategy or do you have one? Don’t get left behind in the social video revolution. In today’s column, I’m sharing the The ABC’s of Social Video Storytelling. Social video is an increasingly critical component of any digital marketing strategy. With 74% of online traffic projected to come from video this year, this content form has to become part of your marketing mix to really engage your consumers. So how do you create a video to share on social media, anyway? Read my blog post How to Tell a Story on Social Video to learn more. The social video tool that saved my working week this week is Wondershare Filmora. Who doesn’t love a gif! GIFs are a great way to make a statement or express an emotion and are highly engaging on social news feeds. They are like emojis with their impact. They are also useful to add into blog posts and keep a reader engaged. The Wondershare Filmora is rated as one of the best of its kind in film and GIF maker software. It is user-friendly and it showcases so many features to aid you in your designing needs for your website and more. Enjoy over 100 features of visual effects as well as complete control over audio and video settings. Create GIF from videos by any format like AVI, MPEG, WAV, DAT, EVO, MKV, MP4, WMV, etc. Allow you to edit GIF with basic editing like crop, combine, rotate, speed up, slow down, color correction. Allow you to edit GIF with wonderful effects, text and subtitles.